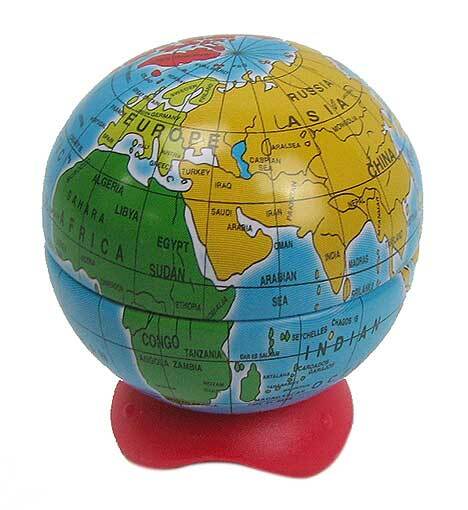 A tad smaller in diameter than a ping pong ball, this colorful steel geographic globe is 1-3/8" dia, but pull out the little base it stands on and you’ll find a small pencil sharpener hidden inside. Also suitable for hiding secret messages, which is always handy. 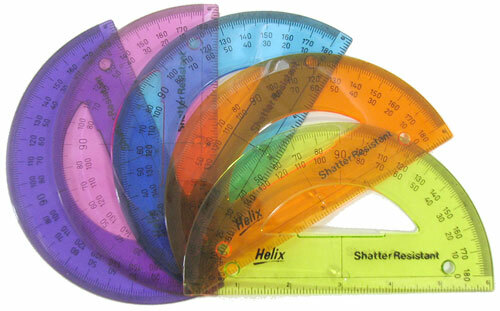 When we were your age, our protractors were all just plain clear plastic. You kids today can get them in translucent blue, red, orange, purple or green, but we're going to pick because we didn't get to then. These pretty ones are 6" wide and read from 0-6" x 1/16" on the bottom and from 0-180 degrees x 0.5-degrees bidirectionally along the arc. 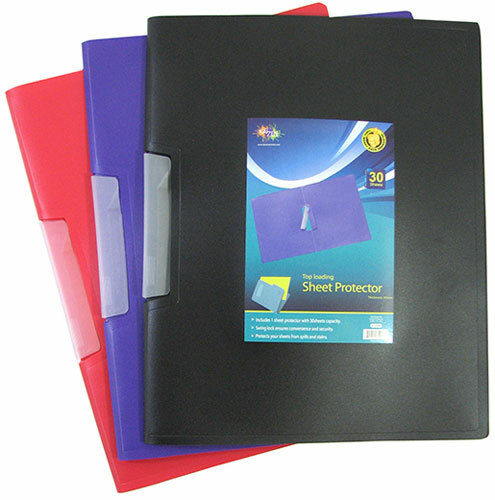 Include holes for a 3-ring binder. 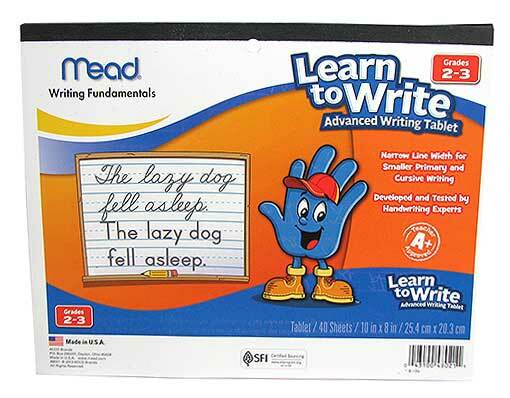 Bring back cursive writing with this 40-sheet, bound writing tablet for kiddies, with 1/2” blue rules divided by a dotted line to help place ascenders and descenders. 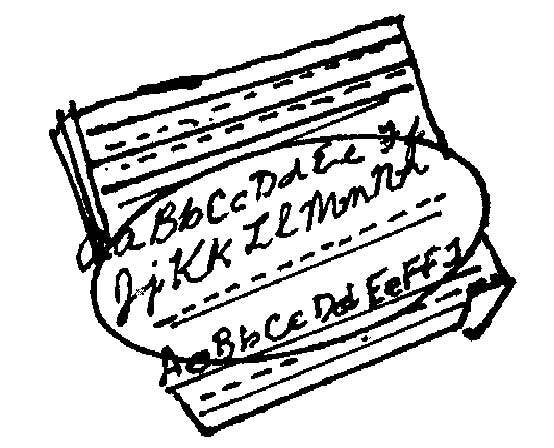 Pages are 10” wide x 8” long, and the inside cover has both cursive and print alphabets in upper and lower case. For grades 2 and 3. 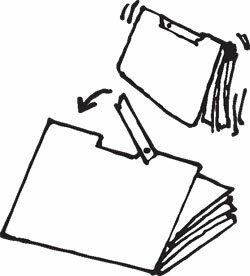 Or presentation folders. They’re plastic covers at 11-1/2” x 9-1/4” with a swinging lock on the spine that will grip up to (30) sheets without your having to punch holes in them. Assorted colors including red, purple and black, from which we’ll pick as a nice surprise for you. 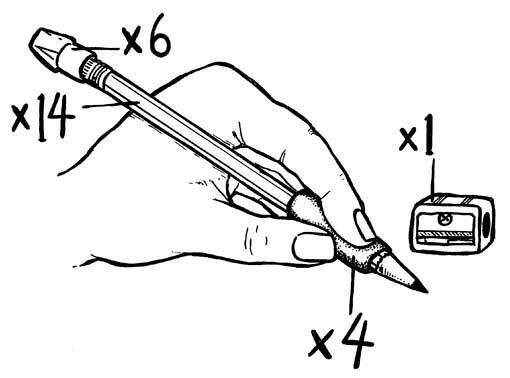 School is a tiny bit more tolerable when they can sharpen pencils in these. 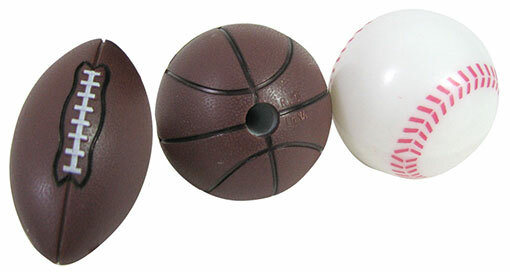 You get a 2" dia baseball and basketball and a 2-1/2" long football that, as a bonus, sits on a tiny kicking tee. 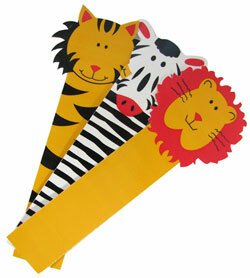 These punch-out, coated-card-stock bookmarks are approx 8" long, with happy, cartoonish beastie heads on top and small graduated rulers on the back. 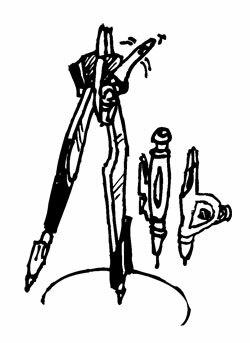 Could be nice little stick puppets, too. 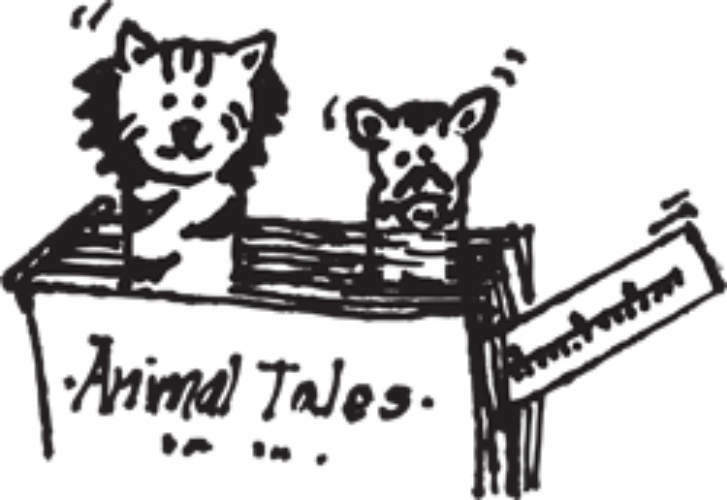 You get a total of (12) cards with a lion, tiger, zebra, hippo, elephant and koala. For a total of 36 bookmarks. Enough for the whole class, or every kid at the zoo-themed party. Better than your average compass set, this beauty from Maped is 5-1/4" long with a 2mm lead plus a spare, 1mm mechanical pencil, an attachment to put your own pencil in, a small lead sharpener, sliding point guard and a clutch. 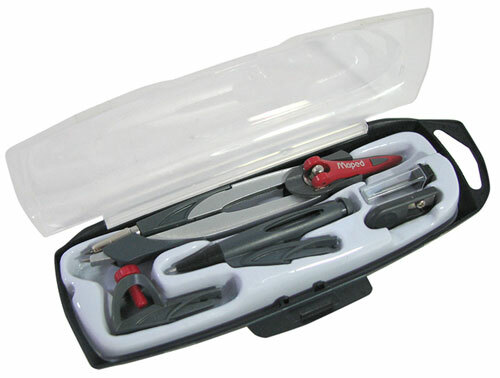 Opens to a max of 5-3/4" and comes in a snap-shut case. 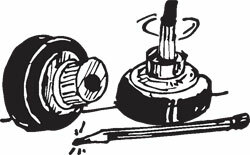 From what mind sprang these pencil sharpener/erasers that look exactly like auto wheels and tires, we could only guess, but we won’t because we just work here. 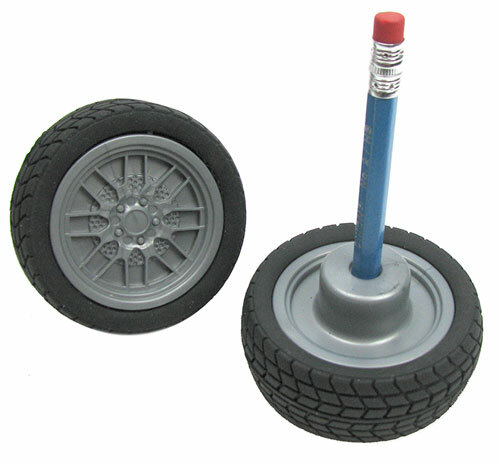 You’ll get (2) black eraser tires on grey wheels that conceal pencil sharpeners. 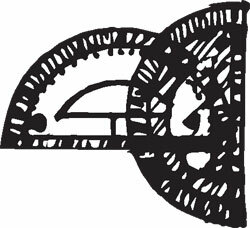 The peelings stay in the wheel hubs until you empty them. Measure 2-5/8" dia x 7/8" thick. 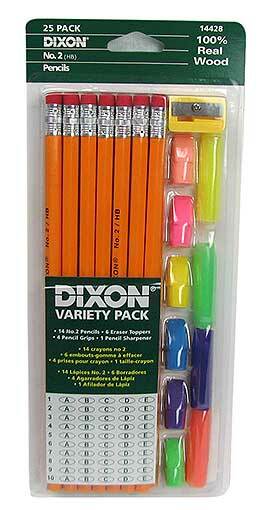 From Dixon®, the pencil people, this 25-piece set includes (14) #2 pencils with erasers, (6) additional 1” pencil-top erasers in assorted colors for the error-prone, (4) rubber pencil grips, and a little plastic pencil sharpener. Almost makes us want to go take the SATs again. Almost.